Spring Violets before I ripped out the darker blue. 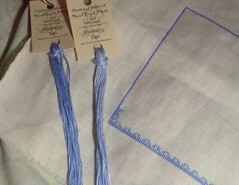 And now stitched with the lighter blue. I'm much happier now. I went stitching today at JoAnne Nantz's. 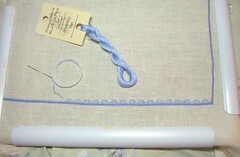 It's always so nice to get out and stitch and be around other stitchers. 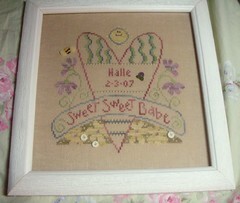 I had a surprise when I got there... JoAnne finished framing my Sweet Sweet Babe birth sampler. It wasn't supposed to be done for three more weeks! I'm so happy with how it turned out. I can't wait to give it to my brother and SIL now! 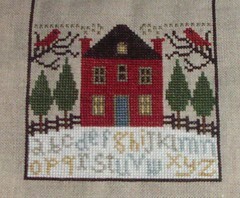 While I was there I also stitched a little bit on Winter Wind. I made a small goal to get the branches and birds done, which I did! Sweet babe turned out so great!!!!! I've had big differences in "Morning Glory"....Love the Sweet Baby, too! Sweet Babe turned out beautifully! Love your progress on Winter Wind too. Sweet Babe is so cute. I love nice surprises :-). Sweet babe is adorable! Great progress on Winter Wind and Spring Violets. I probably would have switched out the thread for the lighter one too. Makes a big difference! I love the Sweet Babe! It is beautiful and the framing is just perfect. Great progress on the others. This sweet baby is really cute !!! 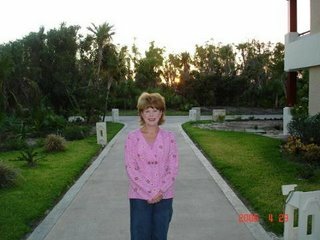 Sweet Babe looks great! What a special gift!